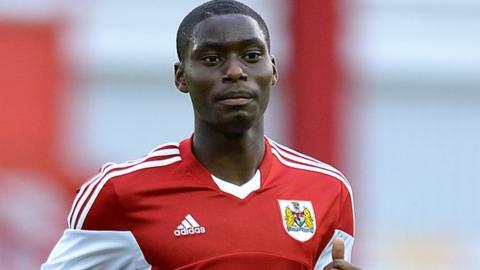 Cheltenham Town have signed midfielder Jordan Wynter on a one-month loan from League One side Bristol City. Wynter, 20, came through Arsenal's academy system and was signed by City last summer. He has played seven games for the Ashton Gate outfit and his only appearance so far this season came against Oxford in the League Cup. "Jordan's been on the radar for most of pre-season," Cheltenham manager Mark Yates told BBC Radio Gloucestershire. "He's desperate to get a chance to play some games and hopefully he'll get to do that over the next month." Wynter is eligible to play in Cheltenham's League Two game at Tranmere on Saturday. "I think it's a fantastic move for him," City manager Steve Cotterill added to BBC Radio Bristol. "It will be good to get him out and get him some League football under his belt. "I've not been in a position before where I can do this with our young players and it's something I'm keen to do."